Day-trippers to the South Wales resort of Barry Island were bemused to see an extraordinary event one Friday morning in February, reports The Baptist Times. As they sat drinking coffee in the seafront cafes, more than 40 young men and women walked into the sea – for another baptism organised by a Baptist church in Cardiff. Tredegarville Baptist Church is a city-centre church built in 1863, in an area which includes the South Wales Baptist College, Cardiff. Over the last 13 years the church has become engaged with refugees and asylum seekers, in addition to students and other internationals with a specific ministry seeking to reach Muslims with the Gospel of Jesus Christ. It is not unusual to hear the pastor’s message being translated into a number of languages as groups huddle around a translator. The largest language group is Farsi. Two midweek Bible studies on Wednesday and Friday at the church have now divided into two sittings, with an average attendance of 70 people. The first session is a rolling programme to introduce people to the basic beliefs and behaviours of Christians, followed by specific preparation for baptism. The second sitting is a Bible study for those who are endeavouring to live the disciplined Christian life. All baptismal candidates are interviewed by the deacons to determine the sincerity of their faith as church pastor, the Revd Phylip Henry Rees, has now relinquished this aspect of his ministry to the wider leadership while he concentrates on preaching and teaching. 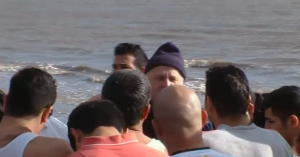 The baptism of more than 40 young adults, primarily from Iran and Afghanistan, in the February seas off Barry Island was the second such baptism in less than a month. Pastor Phyl preached to the waiting candidates (pictured) reminding them of the vows they were taking to follow Jesus. Each candidate made their personal baptismal vows on the beach before the whole group ventured into the waters. Trusted leaders of the church formed three pairs to baptise the candidates who had arrived. As they were coming out of the water another group arrived and the pastor preached again to remind the newcomers of the vows they were making, before this group made their way into the sea and were baptised by two pairs of leaders. As the group boiled kettles on a beach campfire and served hot drinks, they were joined by the curious bystanders who were asking what all this meant. The newly baptised and their friends were able to share their faith with a range of curious Brits who had watched this strange event from a distance. Pastor Phyl said, "They love the Word of God and it is not uncommon for people who have been baptised to come to the next course of baptismal classes and of course everything is translated into Farsi. "Those who are in Christ are expected to evangelise in the city centre (of Cardiff) every week and this and personal witnessing brings a steady flow of new people to the church."